He’s been playing cupid in the house and I am here for it. He has a clear grasp of people’s emotions. I honestly believe that the Hyun Woo – Young Joo ship wouldn’t be sailing as it is right now if it wasn’t for him. Thanks Jae Ho! Remember when he helped Hyun Woo – Young Joo clear their misunderstanding? Or when he created an oppoortunity for skinship between Hyun Woo and Young Joo? If you haven’t already, check our first post on Heart Signal 2! With everyone’s occupation and age revealed, the dynamics are slightly shifting. This can be a good or a bad thing depending on who you are. For Hyun Woo, the reveal is great. He was already perceived as charismatic but given his age, he also appears more mature. Also, what’s not to find attractive in a man who cooks? However, the age reveal was bad news for Gyu Bin. He turns out to be the youngest. I can see him heading for the Friend Zone and staying there. I doubt that we’ll have a dongsaeng-noona romance here. Sad. There are a few highlights in this episode. Let me walk you through the most important scenes. Spoilers ahead. Heart Signal 2 is a dating reality TV show, which brings together a group of women and men together in the same house. Without further ado, let’s talk about the cast. If I had to use one word to describe her it would be poised. I’ll confess: Young Ju is my favorite so far. I love how natural she is. Like everyone else, she is here to play the game but she doesn’t try too hard (aka playing desperate). Sadly, I am worried this might not last long. She’s clearly shown interest in somebody who doesn’t seem to reciprocate her feelings. I hope she keeps it moving and finds somebody else to like. If I had to use one word to describe him it would be considerate. Jae Ho cares for every one in the house. This is something that I’ve noticed since the first episode. As one of the few people to arrive first in the house, he warmly welcomed all his other housemates. In addition, he often takes the lead but not in a overbearing way. The break up makes Ji Yeon feel worse. Why is Shi Hoon acting like the bad guy? Is this the best he can do?! Shi Hoon explains that Ji Yeon’s mother mentioned how happy she was wearing her white wedding shoes back then. Now, she just looks nervous. Dong Ha is about to leave when he sees a crying Ji Yeon walking toward her apartment. He stops her, but she doesn’t explain what’s going on.Once back in her apartment, Ji Yeon cries harder. Ji Yeon runs to Dong Ha’s apartment but he doesn’t hear her out. Even before she says a word, he explains that he is sorry for pressuring her (OMG why could you just remain silent for ONCE?!). He will move out as soon as possible to make things less difficult for everyone. The following days Dong Ha starts looking at apartments from right to left. Given his income, the choices aren’t top but he wants to move soon. Soo Chul isn’t happy about Dong Ha’s decision to move. Soo Chul even tries his best to persuade Dong Ha not to move. A painful walk down memory lane as both of our characters think about what their relationship could have been if they had met sooner or if other people weren’t involved. Shi Hoon and Eun Chae both see something that they weren’t supposed to. Eun Chae sees Ji Yeon and Dong Ha kissing when she goes to give Ji Yeon her cellphone. Soo Chul, who closely followed her, urges her to keep silent. 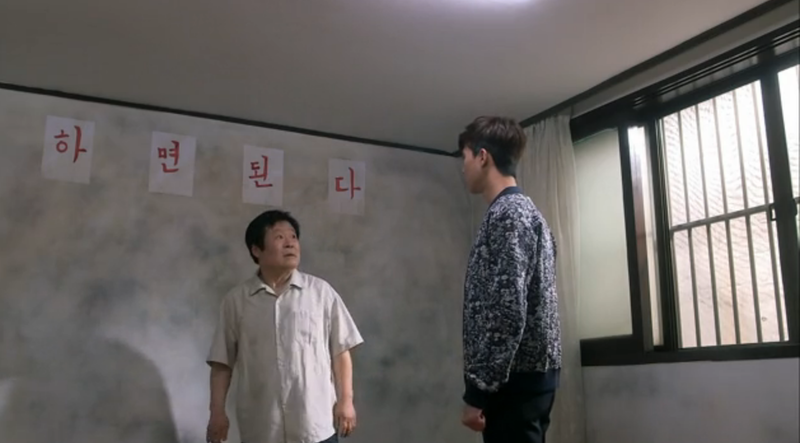 And Shi Hoon sees Ji Yeon helping a drunk Dong Ha in his apartment. Dong Ha breaks down in tears once in his apartment (T__T). The next day Shi Hoon picks up Ji Yeon. He vows to keep behaving well from now on (Let’s see how long that lasts). What is painful is that Dong Ha sees both of them in the car at a traffic light (Painful reminder… Not like he needed it). Once at work, Dong Ha focuses on getting his work done and nothing more. He doesn’t pay attention to Ji Yeon and doesn’t even try to help her. Ji Yeon replays the back hug with Dong Ha. Dong Ha is also thinking about when Ji Yeon lived with Soo Chul and him – Dong Ha feeding Ji Yeon sandwiches he made, teasing her while she was watching TV, etc. (Can those two be any cuter?!). Yet, when both see each other at work they feel awkward. They don’t know what to say or how to act around each other. They try to crack up some jokes and it slightly works. Ji Yeon says that she is happy to be home. Still now, she hears Soo Chul’s voice urging her to get out of the restroom. Shi Hoon’s assistant asks someone in the museum to take the picture with Ji Yeon’s face down. The lady refuses. The picture is already up and visitors have already seen it (Shady assistant). Anyhow it’s too late since Ji Yeon saw it. After Shi Hoon’s confession, reporters gather around them. The unwanted attention causes Shi Hoon to drag Ji Yeon out. Reporters run after them, but are unable to catch them.